Before they go out of season and disappear for the rest of the year I thought I really should share a most delicious pasta dish with asparagus. Having a 5-year old in the house cooking pasta at least once a week is somewhat of a must in our household. I am sure many mummies (or daddies) reading this will be nodding their heads in agreement. It's all fine as both Tom and I enjoy pasta a lot, however, it's not always easy finding new and creative ideas - other than the old trusted tomato sauce - for a good tasting condiment to go with the pasta. Luckily, summer offers a bountiful of colorful vegetables and the Farmers Markets are busting to the rims with a huge variety. As Soeren loves his vegetables and is hardly picky, I am quite lucky to be able to choose from this large assortment. As a matter of fact I often try to visit the Farmers Market with Soeren so he can see the colorful fruits and vegetables offered. Being as inquisitive as any five year old he is always keen to know what a vegetable he has yet to encounter is and what it tastes like. With these questions, he has won the hearts of many farmers (and their wives) selling their fresh produce and the market and we often get small amounts of "freebies" to test. I really like that. We come home and look for a recipe with that particular vegetable or fruit and then we prepare it together. This has made Soeren so open to so many vegetables normal kids his age would not touch. Spinach he adores, parsnips he munches raw or with a dip and kohlrabi is one of his favorites. This year he found a particular penchant to green asparagus and believe me I was thankful for that. We have enjoyed several dishes this summer with the wonderful vegetable, particularly just roasting them gently on a barbecue after they have marinated in a light vinaigrette of olive oil, lemon juice and salt and pepper. But a mum has to be creative and "cool"! 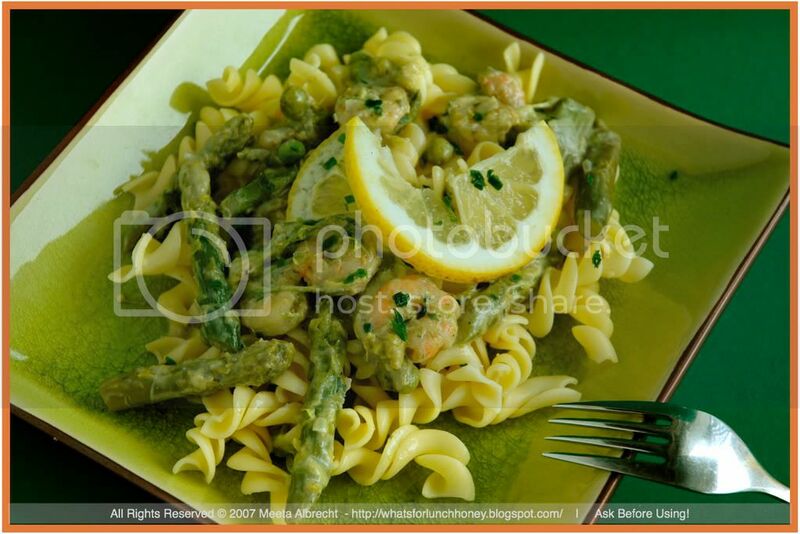 So, when I combined pasta with asparagus and shrimps (another one of his absolute "fave food" this summer) I was the coolest mum ever. I also got a kiss from Tom for making such an elegant and flavorful dish that suited his palate perfectly too. With all that attention and affection I was glowing! In the meantime heat a good dash of olive oil in a pan. 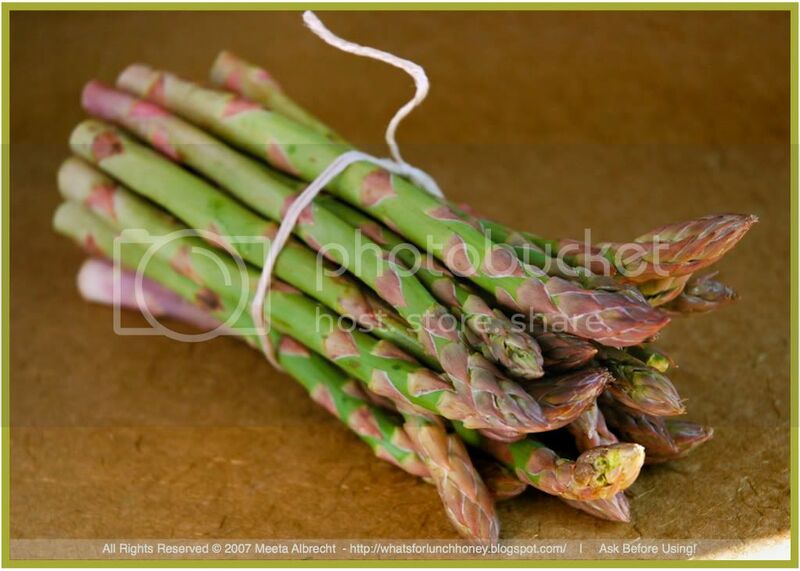 Add the asparagus pieces and gently sauté on a medium heat. Add the garlic and peas and cook for another minute. Add the shrimps and heat through until they turn a wonderful pinky color. Salt and pepper to taste and then pour in the stock (or wine) and allow to simmer. Simmer until the entire mixture reduces to about half, then add the lightly whipped cream, lemon zest and juice. Check for taste and if required salt and pepper the sauce some more. Drain the pasta well. Mix into the sauce and sprinkle with the chives. Sensational! It's an exceptional harmony of flavors that come together in this pasta dish. The best thing is it's ready in 25-30 minutes so you have plenty of time to prepare a nice salad to accompany it if you like. Both my boys really licked of the rests off of the plate. It's nice being the "coolest" mum in town! LOL! Hey, good to have you back. From all that I have read it seems that you all had a great time and more importantly, quality time. I love pasta with any shrimp combo. I'm with Lydia, it's so wonderful your son loves his veggies! 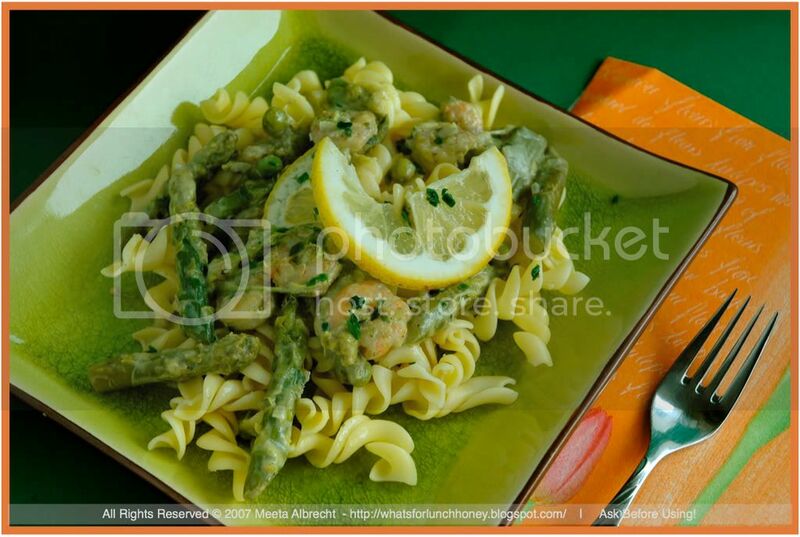 I love this recipe, shrimp and asparagus with pasta sounds like a real winner! So many parents miss by not exposing young children to new things like it's the adventure life is. This is a beautiful thing to foster in Soren! I am so going to try this! My five year old loves asparagus and he loves shrimp too! He is such a good eater, like your little one. I am sure this would be a hit with them! That's so good that your little one is interested in vegetables, and being thought of as a cool Mum is great! Yes, use up the asparagus while you can! Looks like a wonderful pasta dish. Mine decided they didn't like asparagus this year but if you had served them this then I think they'd have eaten the lot! Looks wonderful Meeta. Looks like a great combination. I'll have to try that. 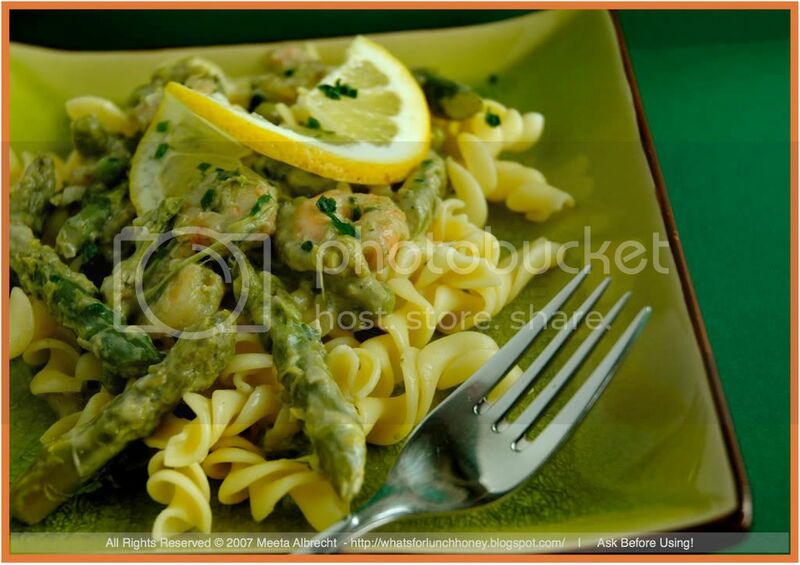 Pasta with shrimps and asparagus is a new one for me! Looks really yummy too..gearing up with recipes for the cold winter days hopefully ahead!